The following tutorials will show you how to view your disk space and bandwidth usage for shared server accounts. The information for each website is displayed in the cPanel specific to the account. Step 2: Look at the right-hand column when you have logged in. Look for the label Disk Usage. 1. Monthly Bandwidth Transfer – directly beneath Disk Space Usage in the left-hand column. This is the amount of data that is transferred between the web server and a visitor’s internet browser for that day. 2. 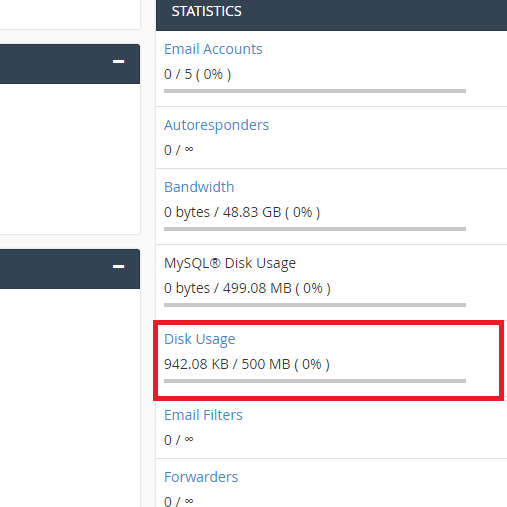 MySQL Disk space – this data is not calculated as part of Disk Space Usage, but is a good number to watch when you are running multiple databases or if a database is getting so large that the website appears to be running slow. Disk space usage is displayed in units of megabytes in the left-hand column. Since shared server accounts do not have a stated limit, you will see the symbol of infinity displayed after the forward slash. Although the web hosting plan states unlimited disk space, the available space is specifically for files that are actively used on your website. It is not to be used for file storage or archival purposes. 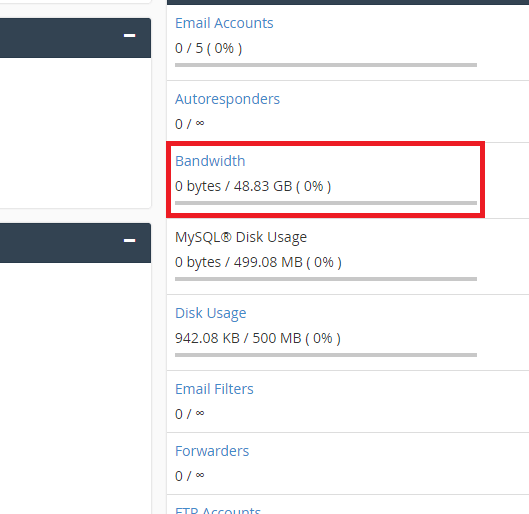 Step 2: Scroll to the section of the cPanel labelled Logs, then click on the icon labelled Bandwidth. When you click on the icon, it will open and show you two graphs of the website traffic for the present day (labelled Today) and the Past 7 days. After that, you will see a 12-month graph and summary pie charts of usage for each of the last 9 months. Each graph is broken down to HTTP, IMAP, POP3, SMTP, and FTP usage. the first two graphs measure activity in bits/second, while the third graph summarises usage for the year in bytes transferred. You can also click on each pie graph and then see a breakdown of the month for ALL traffic and just the HTTP traffic. Using these graphs, you can determine your bandwidth usage and break it down by year, month and each day of the month.